Talent Management can be defined as the expectation of required human capital for an organization and the planning to meet those needs. Talent management is the practice of using calculated human resource formation to develop business value and to make it promising for companies and organizations to reach their objectives. All the efforts made towards recruiting, retaining, developing, rewarding and making people accomplish forms a fragment of talent management as well as planned workforce development. The various accomplishments within talent management include development and high potential management, assessment and succession planning. Earlier talent acquisition or recruiting and performance management were very less often encompassed in the job role of corporate talent management experts. The problem with many companies nowadays is that their organizations put remarkable effort into enticing employees to their company, but spend very little time intoabsorbing and developing talent. A talent management system needs to be worked into the business strategy and implemented in daily procedures entirely within the company. It should not be left exclusively to the human resources department to fascinate and retain employees, but rather must be accomplished at all levels of the association. The business strategy must containaccountabilities for line managers to cultivate the expertise of their immediate subordinates. The Talent management certification course by Brainmeasures explains all the chief aspects of the course in an easy and understandable language. Talent management denotes that companies are tactical and careful in the way they source, train, retain, attract, select, train, develop, endorse, and shift employees through the organization. The research performed on the value of talent management reliably reveals remunerations in serious economic areas such as customer satisfaction, quality, cost, market capitalization, revenue, productivity, and cycle time.The outlook of this more personal human resources approach pursues not only to appoint the most competent and treasured employees but also puts a strong prominence on retaining. From a talent management perspective, employee evaluations apprehend two main areas of measurement which are potential and performance.Talent management decisions are often motivated by a group of organizational core proficiencies as well as position-specific aptitudes. The competency set may comprise of experience, skills, knowledge, and personal traits. Brainmeasures is an ISO certified online certification company renowned for their online certifications and skill testing. After getting enrolled in this course, you would receive an E-book that would guide you for the exam. Upon successful completion of the course, you would be awarded the certification. The average salary of a HR – Talent Manager is around $62,000-$88,000. Salaries vary depending upon the experience and qualification of an individual. Guides you about creating a talent management program for organization excellence. Guides you about conducting performance reviews that improve the quality of your talent base. Explains about improving performance through the employee value exchange. Discusses about succession and career planning. Discusses about formulating, coaching, training and development approaches that drive talent management processes. Explains about making compensation an integral part of your talent management program. How to use talent management processes to drive cultures of excellence. How to target cultures that create competitive advantage for your organization. How to make diversity competitive part pf your advantage. How to use talent analysis and planning techniques to enhance your talent management program. 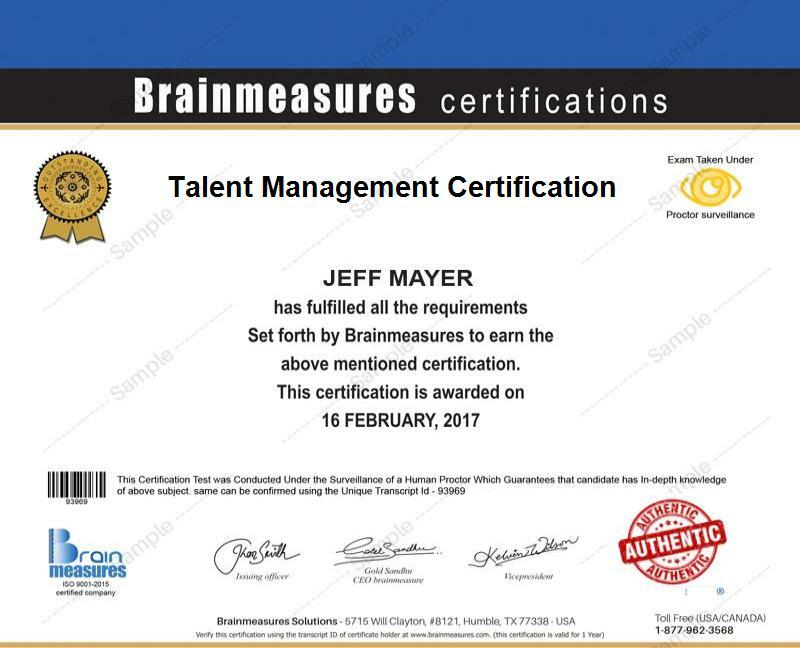 The Talent management certification course by Brainmeasures is a fabulous opportunity for all the aspiring individuals working in a human resource department of an organization and have a deep interest in planning, recruiting, compensating, developing, and positioning processes in a HR department of an organization. This online certification will be an added benefit to your already existing skill set and qualification for experienced individuals in this field. Most of the organizations look forward to recruit certified professionals in this area and it is always an advantage to get certified from an established company. Brainmeasures certifications are accepted and recognized worldwide.